February, 2011. Salem, Missouri. 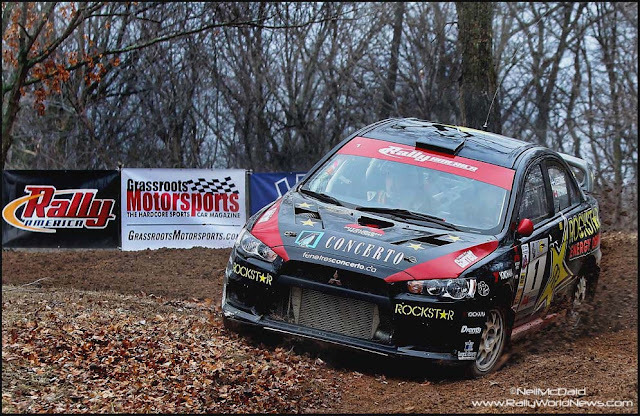 After a DNF at round one of the 2011 Rally America Championship, Canadian and U.S. Rally Champions Antoine L’Estage and co-driver Nathalie Richard got back to their winning ways by claiming victory at the 2011 Rally in the 100 Acre Wood. Despite massive pressure for Team Subaru USA and some challenging stage conditions L’Estage and Richard prevailed to take the top spot on the podium. Team Subaru drivers David Higgins and Dave Mirra would round out the overall podium. As the crews headed out for the recce Thursday morning they were greeted with some torrential downpours on the stages which made for some very tough going. 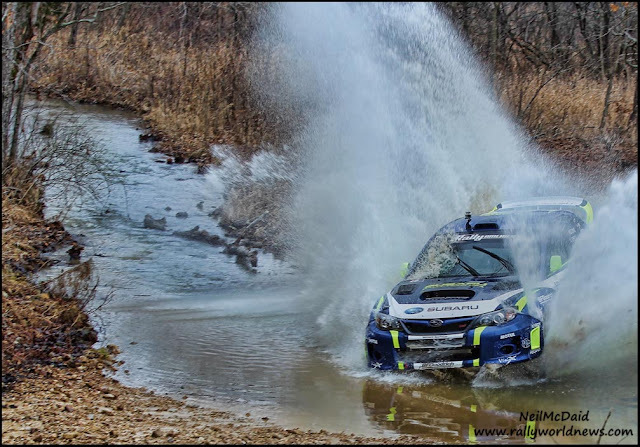 Many of the small creek crossings that are a trademark of the rally quickly rose to flood conditions leaving them quite challenging to navigate. The heavy rain would continue throughout the day leaving several sections of the stages water logged and quite muddy in places. As Friday morning rolled around the rain had cleared out of the area but crews were left wondering how the torrential rain had affected stage conditions. Tire choice would be a critical factor on the opening day. 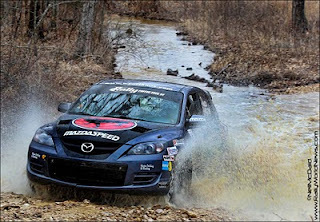 Making a surprise last minute entry to the rally was 4-time Rally America Champion Travis Pastrana. Travis, who has made the move to NASCAR, came directly from a race in Phoenix, Arizona on Thursday evening and did not have an opportunity to pre-recce any of the stages nor get familiar with his car or new co-driver for this event, Jeremy Wimpy. Adding to his challenges, Travis also drew the short straw in the draw for road position, putting him out first on the road. This was not a desirable position with the questionable conditions and many sections of loose gravel. SS1, a short jaunt around the fairgrounds in Potosi, would see Antoine L’Estage set the fasted time with little or no drama. It was then onto the first real stages of the rally. Running first on the road and pushing just a little too hard, Pastrana’s brief return to rally would come to a sudden and spectacular end on SS2 “Country Line 1”. Less than a mile into SS2, driving the same car that the late great Colin McRae spectacularly rolled at X-Games 12 in 2006, Pastrana slid wide clipping several trees before coming to a rest back on the stage partially blocking the road. With little more than a bruised ego, Pastrana and his co-driver Jeremy Wimpy would walk away from the wreck uninjured, but the car may very well have seen its last stage. SS2 would also see the retirement of up and coming driver Joseph Burke. We had hoped to see Burke continuing the battle he had with Dave Mirra at Sno *Drift, but it was not to be on this event. A pre-event engine swap led to some electrical gremlins working their way into Burke’s Evo. Despite the torrential downpours on Thursday and some of the creeks remaining at flood condition, the stage roads had drained off remarkable quickly. Antoine L’Estage would gamble on drier roads in his tire choice, a gamble that would pay off for the reigning Rally America Champion. L’Estage set fastest times on three of the first four stages of the rally while others who had opted for narrow mud tires lost time in the dry conditions. Heading into the first service on day one, L’Estage in his Mitsubishi had already opened a significant gap on Subaru driver David Higgins in second and Dave Mirra in third. SS5, “Pandora Westover,” would be cancelled due to an overflowing creek on the transit to the stage. SS6, “Ollie’s Camel,” a classic stage on the rally was also first of the night stages. Now running first on the road with Pastrana’s retirement, L’Estage would attack hard stopping the clock with a 2 second margin on David Higgins. Privateer Ramana Lagemann would nip Subaru Team driver Dave Mirra by one second for third. 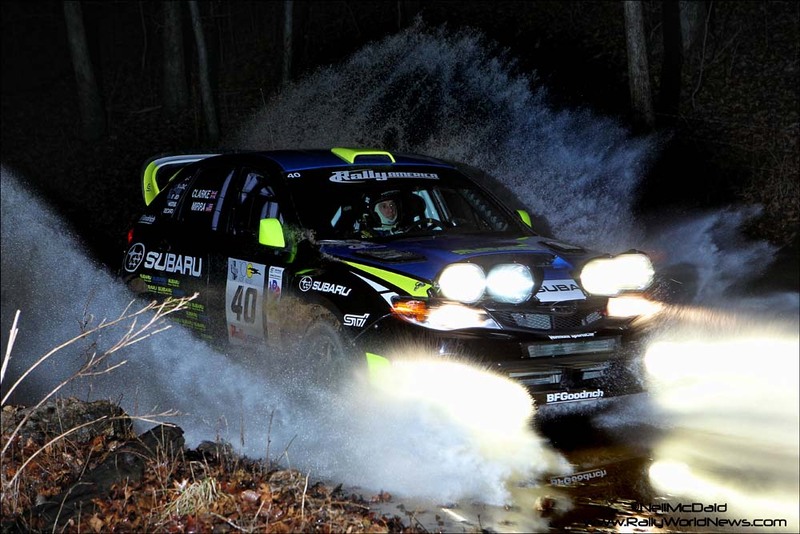 As the cars headed back to Salem for the overnight halt, Antoine L’Estage held his overall lead with Team Subaru USA drivers David Higgins and Dave Mirra rounding out the top three. With Chris Duplessis missing from the 2WD line up, his fellow instructor from the Team O’Neil Driving School would take up the reins. Wyatt Knox would lead the 2WD charge throughout day one in his Mazda Speed 3. Knox, who has teamed up with co-driver Ole Holter for 2011, managed to open a 23 second gap on Chris Greenhouse in a Plymouth Neon in second. Rounding out the top three in 2WD was Ford Racing’s Dillon Van Way. Dillon, who had taken the overall 2WD victory at Sno*Drift, suffered some electrical issues in his Ford Fiesta on the opening stages and was now trailing Knox by over 2 minutes at the end of day one. As we moved into day two it seemed from the outside looking in that Higgins was not 100% committed to his notes. David and his co-driver Craig Drew are somewhat new to each other as this was just their second event together. They would have a narrow escape on SS7, the first stage on day two after they misjudged a fast crest which resulted in an off-road excursion between some tree stumps. David managed to get his Subaru back on the road and was able to finish the stage. For Ramana Lagemann and Chrissie Beavis their rally would come to a flaming end on SS8. A sudden flat wheel would result in a high speed wreck in their 2008 SP Class Subaru Impreza, which was followed by a small fire. Both Ramana and Chrissie were lucky to escape unharmed, but the stage had to be cancelled for all cars running after Lagemann as his mangled Subaru was blocking the road. Carrying his momentum forward from day one, Antoine L’Estage seemed untouchable as he set the fastest times on the first three stages of day two despite running first on the road. At the mid-day service halt Team Subaru driver David Higgins seemed resigned to the fact that he was clearly not on L’Estage pace and was more focused now on protecting his second place and tweaking the car setup. While Higgins struggled to find his form his teammate Dave Mirra was very satisfied with his progress. “My car setup is the best I’ve ever had. Marshall and I have a good rhythm going. I am really focused on driving to the notes; it’s good, and it just feels right,” he commented. With the departure of Ramana Lagemann from the SP Class battle, and holding a little over a minute lead on their nearest challenger, Travis and Terry Hanson seemed well on their way to yet another class victory in their SP Subaru Impreza. Behind the Hanson’s the battle for 2nd in SP Class was far from settled however. Roman Pakos and Bartosz Sawicki were in a tight battle with Laughlin O'Sullivan and Scott Putnam who were struggling with some overheating issues. The 2WD battle was unchanged from day one with Wyatt Knox holding a commanding lead in the Mazda over Chris Greenhouse and Dillon Van Way. After completing another dash around the short spectator [SS10] stage in Potosi, it was back out to tackle the six remaining stages of the rally. SS11, “Floyd Tower West,” again we would see yet another cruising blow from L’Estage as he set a stage time some 5 seconds faster than Higgins over the 10-mile test. SS11 may have been the best indication of Antoine’s pace at 100AW. This was the third pass on this stage for the teams and with perfect road conditions we expected to see Higgins put in a big push and take the stage victory, but he had no answer for the Canadians’ pace. Antoine L’Estage and co-driver Nathalie Richard would push on to take stage wins on SS12 and SS13 before dialing it back a notch as they took a more conservative approach over the final 3 stages on their way to a well deserved victory. David Higgins would take stage victories on SS14, SS15 and SS16 to close within 17 seconds of L’Estage at the final time control. 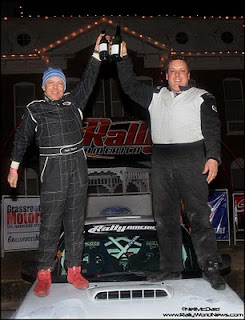 Dave Mirra and his new Irish co-driver Marshall Clarke would enjoy their second podium finish of 2011 in third. Taking into consideration that L’Estage was running first on the road throughout the rally on some very difficult stage conditions, this victory truly highlights Antoine’s pace over Higgins and the rest of the field. Travis and Terry Hanson maintained their pace to take overall SP class honors, and continue to build on their SP and Overall championship standings. Laughlin O'Sullivan would put in a massive push over the final three stages of the rally to grab second overall in SP Class from Roman Pakos by the narrowest of margin. Making it a perfect 1, 2, 3 SP Podium finish for Subaru. 2WD honors went to Wyatt Knox and Ole Holter in the Mazda. Chris Greenhouse put in an epic drive and claimed second while Ford Racing’s Dillon Van Way would have to settle for third in his Fiesta. The RallyCar/RallyAmerica Championship will now head west to the city of Ocean Shores, Washington, for round number three, Olympus Rally. Assuming Antoine L’Estage can secure funding to compete out west, I would predict a similar result to 100AW. Without question L’Estage has the edge on Higgins in both prior knowledge of Olympus and more seat time in a familiar car and with a familiar co-driver. Subaru Rally Team USA is also set to debut new cars from both Higgins and Mirra at Olympus. Will we see the return of the sedan? Time will tell. Graham Wilcock from Auto Sports Engineering out of Ann Arbor, Michigan will also unveil a brand new Mitsubishi Evo X at Olympus. The driver has yet to be disclosed. 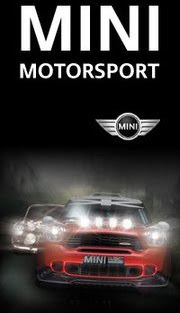 Expect an event preview as we get closer to the rally date.